Mr. Underdown has extensive experience as a Claims Adjuster, Claims Supervisor, and Claims Manager both with a third-party administrator (TPA) and with an insurance company. In addition, Mr. Underdown has negotiated several large contracts with TPA’s both locally and nationally. Mr. Underdown has claims experience working for an insurance company, a third party claims administrator, and as the Risk Manager for several corporations. The potential for bad faith arises when an insurance company has an opportunity to settle a claim against their insured within the policy limits but tries to save a few dollars by offering less than policy limits. Under these circumstances, an insured may have a bad faith claim against the insurance company. Mr. Underdown has consulted on several claims of this nature when extra-contractual damages are an issue because of the bad faith claims handling. The insurance company has a duty to complete a diligent investigation of the claim of their insured in a timely manner, whether it is a first party (property) claim or a third-party liability claim. The insurance company has a duty to inform their insured of the status of the claims in a reasonable and timely manner. The insurance company has a duty to settle claims against their insured within the policy limits whenever reasonably possible. In addition, the insurance company must comply with the applicable state unfair claims practices statutes. The insured has a duty to promptly report any claims they are involved in to their insurance company. In addition, the insured has an obligation to cooperate with the insurance company in investigating any claim against the insured. Mr. Underdown had over ten years of experience as a Claims Adjuster, Claims Supervisor and Claims Manager prior to becoming a Risk Manager. As a Risk Manager, Mr. Underdown managed self-insured programs where he had claims supervisors reporting to him for both workers’ compensation claims and liability claims, with a large volume of vehicle liability and medical malpractice claims. With his background as a Claims Manager and Risk Manager, Mr. Underdown has a great deal of experience setting claims reserves. He understands the different theories regarding reserve setting and appreciates the various approaches to reserve setting, such as reserving for the ultimate incurred loss as opposed to reserving for the maximum expected loss based on actuarial projections. Mr. Underdown has experience in the area of extra-contractual claims both as a Risk Manager and as an expert witness. As a Risk Manager, he has experience dealing with insurance companies that refuse to settle claims within the policy limits, thus putting the insured at financial risk. In addition, Mr. Underdown has testified in cases involving extra-contractual claims, including cases specifically with minimum limits policies where the bad faith rights have been assigned to the Plaintiff. Mr. Underdown has experience in the area of subrogation, both from the insurance company side and the insured’s side. As a Claims Manager, he was responsible for subrogation activities on the hundreds of files in his office. As a Risk Manager, he set up an “in-house” subrogation program (technically a “recovery” program for a self-insured entity). His corporate recovery program resulted in over $300,000 being recovered in the second year of operation. Mr. Underdown enrolled his employer in the inter-company arbitration forum, enabling the corporate risk management department to participate in inter-company arbitration with insurance carriers to increase recovery while expediting claims processing. Mr. Underdown has over ten years experience as a Claims Adjuster, Claims Supervisor and Claims Manager for one of the largest Third Party Administrators (TPA). He has handled a variety of claims in Arizona and California and catastrophe claims in Texas and Missouri. In addition, as a Risk Manager, Mr. Underdown has negotiated TPA contracts with several of the largest TPA’s for services for local claims administration (claims adjusting) and nationwide services. 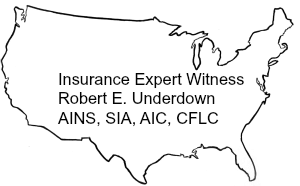 As an Insurance Adjuster, Mr. Underdown routinely worked closely with the attorneys selected by insurance company clients. As a Claims Manager, Mr. Underdown was responsible for supervising litigated files. As a Risk Manager, he was in charge of supervising outside legal counsel on all corporate litigation. Do you have a need for an expert witness in an area of specialization not listed here? whether it be in the insurance field or any other field in which a forensic expert is needed.